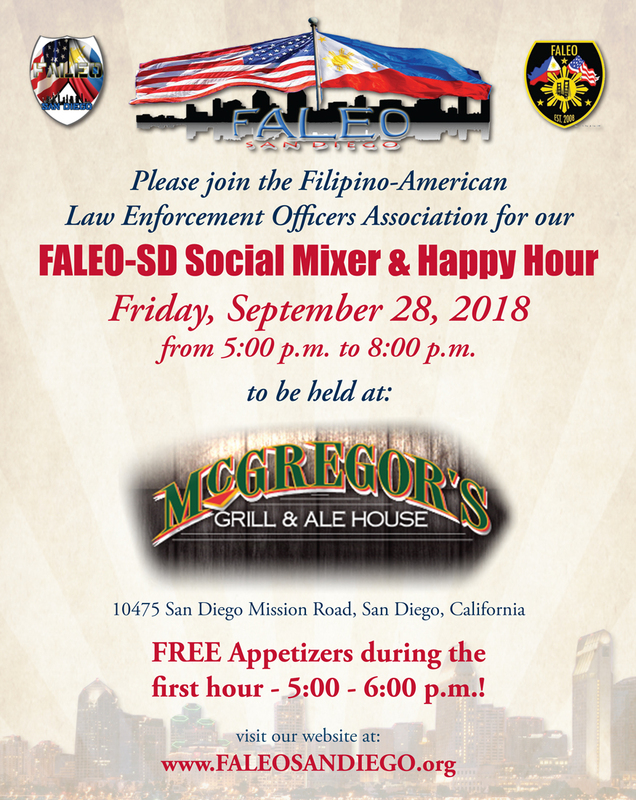 Come and join us at McGregor’s for a social mixer on Friday, September 28th. See attached flyer. We hope this message reaches you and your families in good health and spirit. The holiday season is upon us. Thanksgiving dinners, Christmas shopping, celebrations with our family and friends are highlights for the upcoming season. For some, the season is a reminder of their good fortune throughout the year. Yet for others, it’s a time of frustration, sadness, and despair. The Filipino-American Law Enforcement Officers Association- San Diego Chapter (FALEO-SD) is hosting our 4th annual Helping Families food and gift drive. The purpose of the event is to help those families who are less fortunate with students who are excelling academically. On Wednesday December 7th, we are hosting a bowling social at the Eastlake Tavern & Bowl where you can drop off your donations of cash, gift cards, or unwrapped toys. Bring your family and friends for food, fun, and FREE bowling! On Saturday December 17th, join us at 7:00 AM at the National City Police Department where we will caravan to each family to deliver the gifts. Bring your family and friends to share in this invaluable experience. Download the Flyer for more info – 2016-Helping-Families-Flyer. Family #1 – Parents: Anna and Anthony Children (age): Isaiah (10), Eric (8), and Hanalie (8 mos) The family lost their home and is currently living in a transitional shelter after losing their apartment. Isaiah and Eric love Minecraft and Pokémon. Family #4 – Parents: Ana and Amador Children (age): Ariana (9), Mariana (8), Angela (7), and Natalie (6) Family situation is not disclosed other than financial hardships. Congratulations again and much success! !